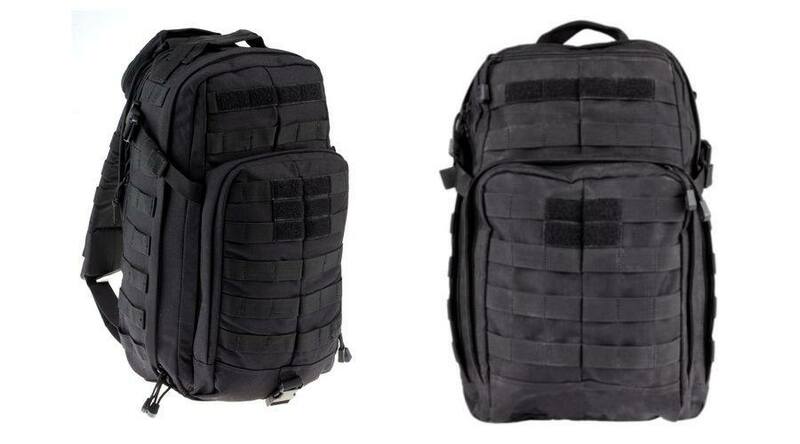 The MOAB 10 and 12 are two tactical survival packs from 5.11 Tactical. They are intended for a variety of uses, including bug-out bags, hunting, fishing, hiking, and any other outdoor activities. Both packs provide a convenient way to store your gear and protect it from rain and cold weather. However, choosing the right one could make all the difference when you are stuck outdoors for several days. These tactical packs are part of the RUSH series of packs from 5.11 Tactical. The RUSH Tier System allows you to connect more than one pack together, increasing your storage options. Instead of needing to purchase one large pack that you hardly use, you can combine two smaller packs for your longer trips. The MOAB 10 and Rush 12 are two of the main options in the RUSH series. There are several notable similarities and differences between these two packs. These packs share similar features, yet they are very different. The MOAB 10 is a sling pack, which means that it only contains one shoulder strap. Despite this major difference, they are made by the same company and are part of the same system of connectable backpacks. The first similarity between the MOAB 10 and 12 is the RUSH Tier System. As mentioned, you can connect these backpacks to customize your tactical solutions. Both packs are also made with durable 1050D nylon. This material is lightweight, water resistant, and sturdy. Combined with the quality craftsmanship provided by 5.11 Tactical, either bag should provide many years of use. The primary benefit of the MOAB 10 is the size. It is a compact sling pack that you can use for a day hike. It includes a wide selection of pockets for storing an assortment of gear, while also providing quick access to everything. The slim design of the MOAB 10 may limit its storage capacity. However, the design is also comfortable. If you prefer to wear your pack on one shoulder, the MOAB 10 is the more comfortable option. However, running may be a challenge when the pack is fully loaded. If you want a more versatile option, you may prefer the Rush 12. It is a little bigger than the MOAB 10 and made with the same durable material. With the Rush 12, you get 24-liters of storage space, along with extra pockets for organizing your gear. The Rush 12 is also a backpack, which means that you get two shoulder straps. However, you do have the option to wear it sling-style. This tactical backpack is also equipped with an adjustable sternum strap and external compression straps. These extra straps provide more stability and support, which is especially useful when you are on the move. Which Pack Should You Buy? Both packs are great options for outdoor enthusiasts. These packs come from a highly respected outdoor gear manufacturer. 5.11 Tactical produces some of the top packs and these two options are both great choices. However, the one that you choose may depend on your own preferences and the amount that you need to carry.The primary difference between these two packs includes the size and the straps. The MOAB 12 is slightly larger, with a little more storage space. It also includes two straps, so you can wear it like a standard backpack. However, if you prefer a single strap, the MOAB 10 is one of the most comfortable sling packs available. In the end, if you want more space, you should select the RUSH 12. If you want the lightest option, go with the MOAB 10.